Home > 2-4 Year Old Activities > Cooking Tasty Summer Treats - Outdoors! Summer isn’t really summer unless you spend at least part of the balmy evenings cooking up delicious meals outdoors. After all, every child knows that food tastes a whole lot better when it’s eaten in the fresh air – and now you can prepare the food outdoors as well! Cooking outdoors is always a treat, and it needn’t be difficult with these simple recipes. Some can even be prepared beforehand, so that on the day the actual cooking time can be kept to a minimum. Remember, whether you use a grill or a barbecue, adult supervision is essential. 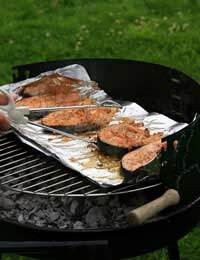 Nothing is easier – and tastier too – than foil cooking when you want to prepare an entire meal outdoors with a minimum of fuss. Also known as a “meal in a foil pouch”, all you need are the right ingredients, a barbecue or outdoor grill, and a roll of kitchen foil. Fish Stew: Put one piece of white fish, eight pieces thinly cut potatoes, one carrot cut up into bite-sized chunks, half a chopped-up onion and a dab of butter onto a large piece of foil, about 12 inches long. Add salt and pepper to taste. Roll up and seal so that the juices cannot escape. Place onto coals or grill for about 20 minutes, turning every so often. Enjoy! Brilliant Beef Balls. Roll up balls of minced meat (seasoned to taste) into bite sized pieces and place onto foil square, adding fresh vegetables such as broccoli florets, diced potato pieces and carrots. Add a small dab of butter if meat is not fatty. Check meat is cooked through completely before eating, and don’t forget the ketchup. Salmon Surprise. Place a salmon fillet directly into the middle of a piece of foil, then add two or three diced spring onions on top. Add a generous amount of soy sauce and roll up. Cook until salmon is no longer a very bright pink – you will need to open up pouch and check. Serve in pouch with a fresh salad and rice. Foil packs that are placed directly onto the coals – not on a grill – will cook faster, and therefore need to be turned more often. Adult supervision is always required, and make sure to open the packs very carefully as the steam can burn. Simply Skewered. This veggie dish can be eaten as a side dish, or on its own as a vegetarian main. Soak bamboo skewers in water overnight, then thread on cut up chunks of coloured peppers, whole mushrooms, red onion quarters, whole cherry tomatoes and large chunks of courgette. Brush with a light vinaigrette if desired, and grill for about 12 minutes per side. Bacon Bananas. Wrap half a peeled banana in a piece of bacon, then place on grill until bacon is completely cooked. Turn often. A lot tastier than it sounds! Corn on the Cob. The easiest way to prepare corn on the cob is to clean the corn, throw it on the grill, turn several times and eat. No, really. If you want to be a bit more adventurous, add salt, pepper, butter and even paprika to taste when cooked. Smores. Pop a marshmallow on a stick and place in fire until melted. Take two digestive biscuits and place four or more squares of chocolate on top of each. Place the hot marshmallow in the middle and press hard, making a little sandwich that will cause the chocolate to melt. This treat gets its name because everyone will ask for “s’more” (some more). Banana Splits. Without peeling the bananas, slice them lengthways. Place a generous portion of chocolate chips and marshmallows inside. Wrap in foil, then place on the coals until both ingredients melt. Trail Mix. This is the easiest way to prepare a simple yet healthy pudding – and one that needs no barbecue or grill. Just mix nuts, chocolate chips, mini marshmallows, seeds, Smarties, popcorn – anything you have on hand that your children enjoy eating. Place in small pots and let them choose the proportions. Place in small plastic bags and tie with a string. Because you’re outdoors, you don’t even have to worry about the mess! Children love eating outdoors - and most children enjoy helping in food preparation. So let them have a hand in making outdoor meals that are healthy, nutritious and easy to prepare. You’re not only preparing meals, you’re preparing memories for years to come.